He has a fear of heights, but that has never interfered with his job. Bill Saunders has been a service technician with Frontier Communications for the last 18 years. If you're having problems with your telephone service, he could be the guy who comes knocking on your front door or hoisting a ladder over your backyard fence. Handsome is a word that has fallen out of use, but it fits Saunders perfectly. With his gym-sculptured physique and brilliant smile, it's easy to imagine him on TV talking about the weather. Considering the amount of time he spends outside, the Rochester native probably understands the term 'wind chill' as well as any meteorologist. We meet at a job site. His van is an electrical warehouse on wheels, jammed floor to ceiling with tools, wires, and electronic parts. 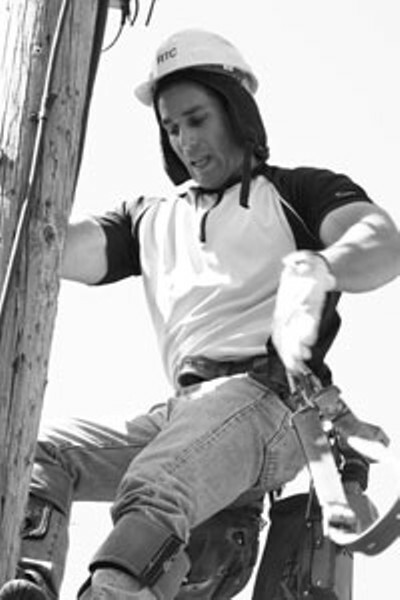 Saunders was only a kid when he first saw a guy up on a telephone pole, working with his hands. He says he knew instantly it was something he wanted to do. We get dispatched in the morning. We all work in crews of about 20 people and we are broken up into geographic areas. The dispatcher tells you where to go and what the customer has called in about, but sometimes you don't know exactly what the job is until you get there. Every job is a little different, so it's not a boring routine. We're the ones that climb the poles and go down inside the manholes. And it's great, because we're on our own. I don't have somebody sitting on my shoulder telling me what to do every minute. I really like the independence. They expect me to be able to make my own decisions out there. It's a pretty technical job at this point. Back when I first started, you only needed three years of related experience. Today, they like to see some college background, too. I work with a lot of people who went to college for a four-year degree, and they didn't expect to be working in a manual-labor job like this. But it's becoming very technical now, and there is a lot of competition with cable and high-speed service. I remember the first time I saw that bundle of wires. You know, the ones with a million different colors. I was afraid at first. I thought, how am I ever going to know what all of this means? But now it makes perfect sense. It's not just the technical side --- it's a very physical job, too. We have four women working with us now, and the physical requirements are hard. It doesn't matter if you're a male or female. We have to pass a physical exam. They want to see that you can lift so much weight, that you can climb a pole, and you have to be able to stand up there for a long period of time. Sometimes my belt alone can weigh 100 pounds. It's not so hard when it is weather like this, but remember, when it's 90 degrees outside and you have to climb through an attic, it's going to be in the 100's in there. You come out soaked from head to toe. You're just drenched. And in the winter, the wind really gets to you on the poles. You get the bees in the summer and the wind burn in the winter. Take your pick. And you're out there every day. Sometimes I get a little worried because I'm already 40, and I don't know how much longer I'll be able to do this as I get older. I'm in good shape and everything, but it's not as easy as it looks. 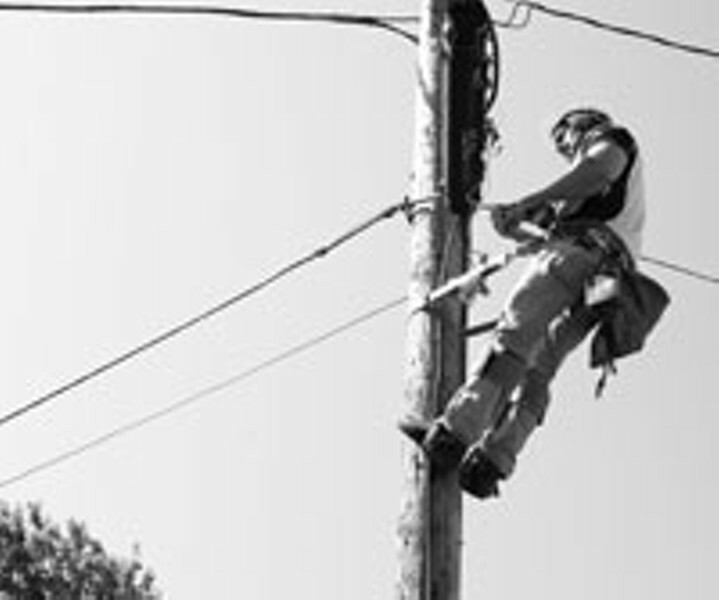 It's not that dangerous in the sense that you're not working with high-voltage like the folks at RG&E. This is DC, not AC; and the voltage is pretty low. It might give you a jolt, but it's not going to kill you. The people, that's the best part of the job. I meet some really colorful people every day. You never know what you're going to get. Yeah, they come to the door in their bathrobes and underwear. I had a lady not long ago who wanted to make me lunch. It's really sweet. They want to help. They know it is a hard job, and they offer things like water and ask if you're okay. They might be a little anxious when you first get there. They aren't angry or screaming mad or anything. They're just a little frustrated, especially if they have lost internet service and they want to get online for work or something. And I understand that. But most of the time, we get there pretty quickly. And they really appreciate it. Plus you get to go in people's homes and see how they design things. I love going into all these homes, especially some of the ones around Park and East Avenue. The architecture and everything is so incredible. We have a union, which I have always belonged to. I really believe in unions. It's been really good to me. And my friends who work for companies where there is no union --- well, they are so disorganized. I know that unions have become less popular over the last few years because companies say they need that in order to be competitive. But I don't think it's true. In the places I've seen where there is no union, management sugarcoats everything downward and the employees are sugarcoating everything upward, so nobody really speaks honestly. We're right on the front lines in direct contact with the customers. They expect us to be honest with them about what customers are feeling. If I wasn't doing this and I was starting all over again, I would love to be an archeologist. I would love to travel all over the world and dig around through all these ancient sites. That would be great.